Trampolines are super fun. They allow kids to spend time outdoors as well as burn calories while developing their motor skills and balance. Adults can use trampolines as well; they can be incorporated into many workouts to add variety and different form of exercise. Truth be told, there are hundreds of trampoline brands on the market. As a parent where do you start choosing the safest and most ideal trampoline for your children? Don’t you worry. We have done the work and researched the five best trampolines to buy. These are trampolines that employ safety measures from nets, padding, spotting belts, and harnesses to ensure your children are not at risk of injury when playing. Before you bring home a trampoline, it is essential that you match it to the users. Some trampolines are suited for smaller children while others may be applicable for older kids and adults. To that extent, it is important not to go over the age or weight limit of your trampoline to ensure safety. You will find lots of different shapes and sizes. Each design is aimed at meeting specific uses. These trampolines have a very powerful bounce. They are the kind you find in gymnastic centers and are used by professional gymnasts to propel them into the air with great force as they train. They are not ideal for home use because they have a high potential for causing injuries in kids. They also have a high price tag. This is the most popular shape of trampolines today. It is a favorite for home use because it is associated with minimal injuries. The circular playing surface does not produce lots of bounce like is experienced with rectangular trampolines. They use circular springs that help to push jumpers towards the center of the trampoline. This design is not as popular as the round trampoline. This is because it is more expensive but is also more durable. They have a much bigger playing surface and still follow the safety procedures employed with other trampoline shapes. These are designed to offer more safety than rectangular-shaped trampolines. They have a large bounce area which is bigger than round-shaped trampolines. Square trampolines strike a balance between a rectangular and a round trampoline which many people find to be the best of both worlds. This factor is one of the important considerations you will have to make when buying a trampoline. It makes the difference between a good bounce and a bad one because of the support it offers. It also helps determine the durability of your trampoline. Look for trampolines with construction from galvanized steel. Do not forget to look at the quality of the welding as well as the ease of installing the frame to the rest of the parts. These are the coiled metal pieces that give the trampoline mat its spring. You should look for strong springs that are rust-resistant. This is to ensure that they won’t collapse over time or before you have had the chance to change them. You will also want to end up with a high-quality mat as it provides the stretch needed when you jump on it. 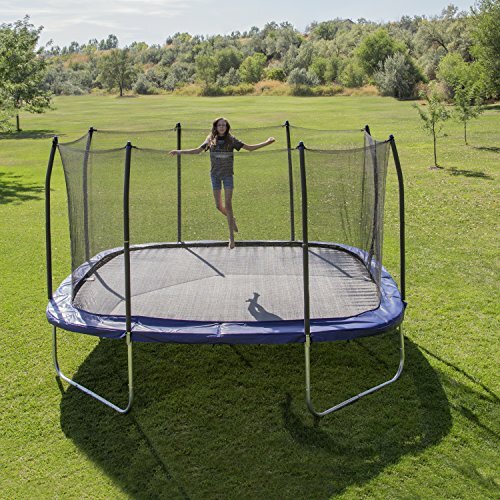 Nowadays, most trampolines for home use must come with an enclosure net. It is made of a thick material which runs around the trampoline. It is a safety measure which ensures that if kids jump too high, they will not land on the ground outside the trampoline which can cause serious injuries. Over time, the net will wear due to heavy use. You should replace this enclosure net with a new one to avoid injuries during heavy use of the trampoline. This is the wide padding that surrounds the edge of the trampoline. It covers the springs and ensures they are not exposed as people jump. They are usually made of a waterproof vinyl cover and foam. Again, you should replace padding over time as it starts to wear to ensure your trampoline is safe. "There is no safe home trampoline,” According to American Academy of Pediatrics (AAP). As such, it is vital that you keep that in mind since kids will be kids and they will need to jump on the safest trampoline. Placing the trampoline as close to the ground as possible is a good thing especially for young kids. You can install it in a pitted area such that the trampoline mat is at ground level. You should not install it around trees and areas where there are structures such as slides and other playground equipment. Also, ensure that you secure the trampoline with harnesses and spotting belts in windy weather to keep it from blowing away and causing potential damage to your or someone else’s home. Never leave kids unsupervised on a trampoline. Ensure your kids always take breaks when jumping on a trampoline. When your kids keep on asking for a trampoline, it is hard to know which model will suit them according to their age. Skywalker Trampolines 15ft. Jump N’ Dunk is the safest bet for kids 6 years and up. This trampoline is round shaped, and it includes a basketball hoop. Being a round shape, your kids will be driven to center thus keeping them safer. With a galvanized steel frame, it is a durable model that will extend the life of your trampoline. 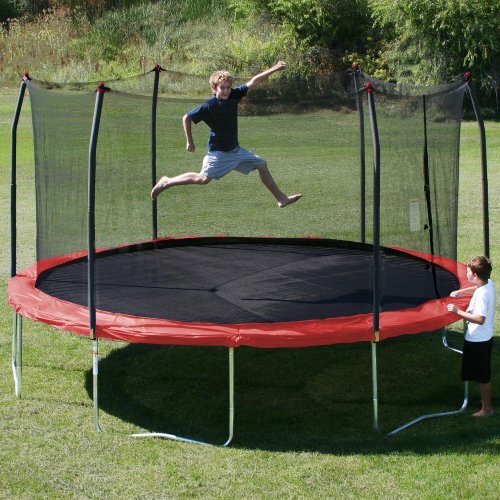 Its patented net enclosure system is perhaps the most outstanding feature of this trampoline. It is a no-gap design since it is usually installed at each spring. This eliminates the gaps that cause pinching when kids are jumping. To increase the stability of this trampoline, Skywalker utilizes T-sockets at the joint between the enclosure and the leg. They are also made of galvanized steel, and they prevent the frame from twisting during heavy use. 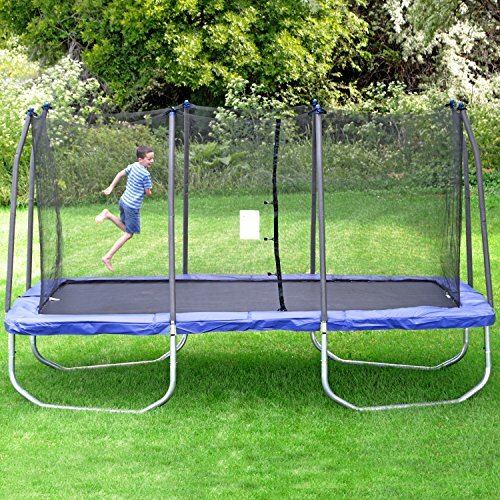 With 96 steel springs that are 6.5 inches long, this model showcases great bounce that will keep all your jumpers happy. The woven mat and padding ensure that the trampoline is comfortable at all times. The enclosure net that comes with the trampolines has latch clips and dual zippers to keep kids safely in the enclosure while jumping. From the rounded shape and multiple safety measures, you can tell it is an excellent pick for use in your backyard. It comes with all the essential specs that allow kids to enjoy playing on a trampoline that meets or exceeds ASTM standards. A basketball hoop is included to provide more play options. It is made of soft but sturdy materials so that that kids can jump and hang from it without risking injury. Skywalker is known for making the most durable trampolines in the market. This 15ft. trampoline is no exception as it falls at par with the ASTM standards. 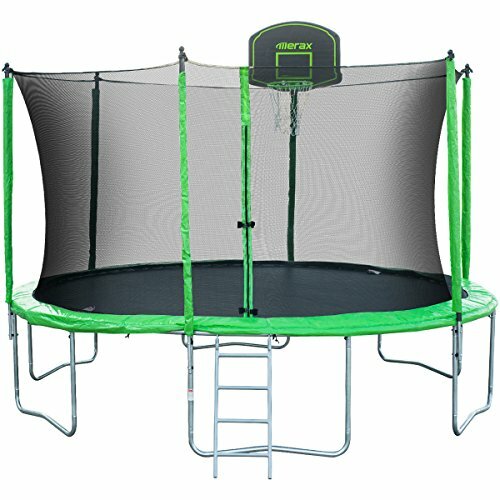 This trampoline is much like the Jump N’ Dunk model only it does not have the basketball rim and hoop. Otherwise, you get all the advantages of investing in a Skywalker Trampoline. The frame boasts a galvanized steel construction. It is powder coated to improve its durability since it is not going to show any signs of rust when left out in the weather. The jumping mat also expresses longevity thanks to the use of heavy-duty UV-resistant polypropylene. It is a popular material that will not fade over time. This trampoline comes with 96 heavy-gauge springs. They are the wheels behind the powerful bounce experienced on this trampoline. They are all come with ample padding which keeps young feet from being injured if your kids step on the edges of the jumping mat. Skywalker is all about safety, and the enclosure net speaks volumes. 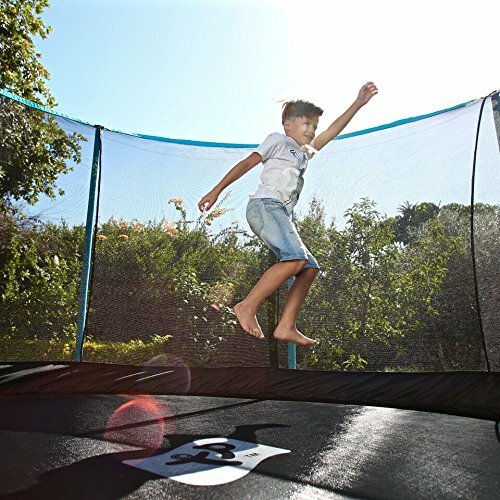 Like the Jump N’ Dunk, this trampoline uses an exclusive buttonhole feature which allows the net to interlock with the jumping mat seamlessly. You will find it exceptionally useful since there are no gaps left between the net and the mat. What’s more, it includes the T-sockets that stabilize the upper structure to prevent twisting during heavy use or when it is used in windy conditions. If your kids love jumping on your bed, you better take the fun outside with the Skywalker Trampoline. Enclosure and jumping mat create a uni-bodied frame for improved safety. 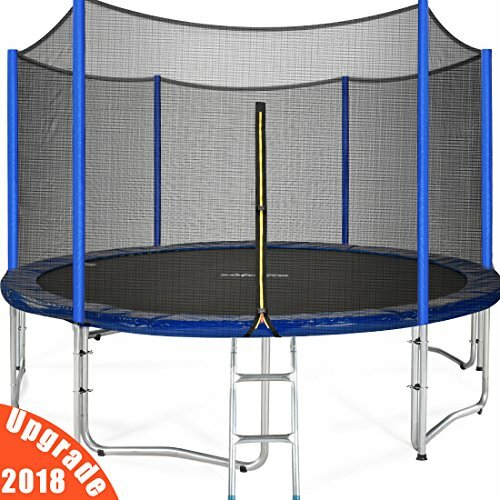 Get the Exacme TUV Approved Trampoline on a budget. 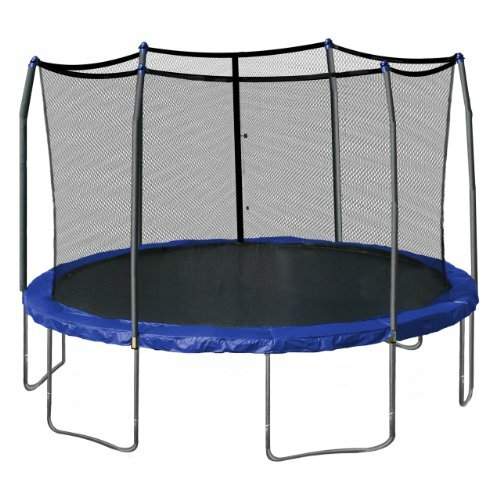 It is an outstanding model that exceeds our expectations for a budget or entry level trampoline. First, we like that it uses galvanized steel on the frame which is the strongest in the world of trampolines. It has a large weight capacity of 375 pounds making it one of the most reliable models to allow more kids to play on it. 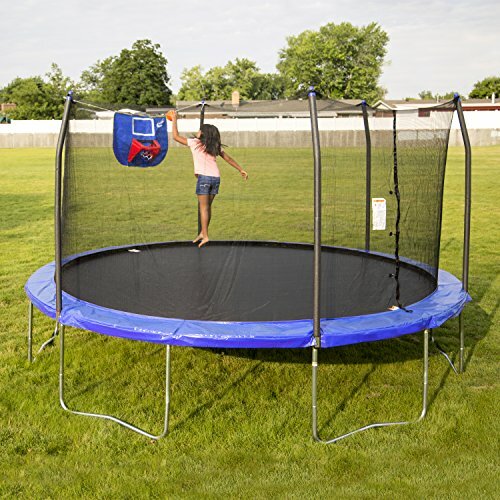 With six W-shaped legs, this trampoline is unlike other models since it has 12 contact points that are all balanced. It is not welded meaning it does not have a weak point that could translate into breaking when subjected to everyday use. This model provides your kids with enough play power as it can support heavy use. With the 7-inch heavy-gauged springs, it is no wonder why it is a popular choice among older kids. In fact, Exacme agrees that even adults can keep in touch with their childhood and jump in this trampoline as well. Looking at the mat and the net enclosure, we have a trampoline that uses UV-protected materials in its construction. It meets all the stringent specifications by TUV, a German businesses association that inspects products. Now you can rest easy knowing your product has been tested and passed showing its safety and quality. We like that the net enclosure is made of high-density polyethylene material. Complemented by a heavy-duty, wide tooth zipper, your kids will never land on the outside as it will never rip apart when in use. You’ll only have to watch out for signs of wear so that you can replace it in time. Even if you are on a budget, your family can still get in the fun of jumping, training, and being active on a trampoline with Exacme. The Zupapa 15ft. Trampoline is designed to safeguard fun seekers as they perform their flips. It showcases a few developments not seen in their previous models. The frame and poles go through the hot-dip galvanizing process to increase the longevity by up to 10 years. This trampoline has a wide playing surface. More than one kid can play and jump without the issue of running into each other. It stretches 6ft upwards to allow the highest jumps and flips while retaining the support and stability needed for safe landings. 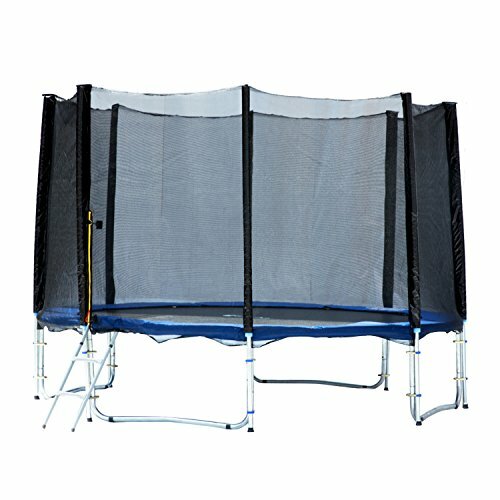 You will like the convenient zipper door since it is not only easy to access the trampoline but there is a ladder to do it safely. Now you won’t risk your kids falling from jumping from the trampoline when exiting. It has ample padding to protect young feet, and the netting enclosure keeps all kids in a safe playing space. It explores longer net poles that have steel joints. This way, they will not collapse from extra pressure. The attachments are tight and firm to give you peace of mind for continuous play. The assembly process is perhaps the easiest that we have seen so far. Maybe it’s because of the detailed instructions, or it’s because of the included assembly tools like the spring puller. The installation and assembly instructions are easy to follow thanks to the included videos. You even get a pair of gloves for smooth installation of the parts. Lastly, you have wind stakes that also have a construction from galvanized steel. After all, they are designed to keep the trampoline stable in windy conditions. And when it is rainy, snowing, or not in use, you get to use the included cover to protect the trampoline. It looks like we have a winner in the best well-rounded trampoline for ultimate fun. This model includes a basketball hoop for more play. If your kid is aspiring to be in the NBA or WNBA in a couple of years, they can drive their passion for basketball by dunking high using this trampoline. The 4-step ladder provides convenient entry and exit. It should be aligned to the wide-tooth zipper opening in the net to preserve its purpose. We love that the Merax also meets stringent standardization standards. The galvanized steel frame can last decades, so you will get full value for investing in your kids’ joy as they grow up. Luckily, it can support up to 330 pounds meaning even as your kids grow up they will not outgrow the support provided by this trampoline. If you need an exciting way to improve your kids’ agility and motor skills, you can rest easy when you have Merax. The round shape is a sure pick since it has ample bounce to facilitate their physical training in a fun and engaging way. So, your trampoline has arrived in a few boxes, and you are unsure where to start with the assembly process. The first step is to empty all the contents to ensure you have everything you need. Spread everything out and check it out against your instructions pamphlet. 1. Assemble the Frame - Your round trampoline will come with circular pieces. Put the pieces on the ground in a circle and start snapping them together to attach them. They should make a ring when you are done connecting. 2. Assemble the Legs - You will find spots where the legs are designed to attach. The legs can be a little tricky to insert so you can use the rubber mallet to deliver a soft blow when putting them in place. 3. Secure the Legs to the Frame - Now it’s time to insert the screws and bolts to the frame. Ensure that you have the right screws for the appropriate holes. Use a drill if possible to speed this process up; you can use a regular screw driver though it will just take longer. The legs should be facing upwards when you are done installing them. Ask someone to help you flip it over so that you are ready for the next step. After you have flipped it over, inspect it to ensure you don’t have loose parts that may be wobbly. 4. Installing the Trampoline Mat - You will need help for proper alignment of the springs. Count the hooks on the mat. Both of you should have an even number of springs and then position yourself at opposite ends of the jumping mat. Install the springs evenly around the mat. Then attach the springs to the hooks on the frame evenly. Use the spring puller and the rubber mallet to ensure the springs stay fastened to frame. 5. Install the Padding - As we said, it covers the springs to protect from injuries. The padding goes directly over the springs. Your padding will have holes to line up with the legs. They will also come with ropes, Velcro, or hooks that secure the padding to the trampoline. 6. Install the Net Enclosure - First, attach the net to the bungee loops. Connect the poles and cover them with foam. Next, use a power drill or the screwdriver to attach the screws securely. Find the hooks on the bungee loops and then find the holes in the posts. Attach the hooks to the holes on the posts. Now, place the posts in the O-rings of the nets by lifting them one by one. Lastly, raise the enclosure net in place. Inspect your trampoline and make sure that each part has been installed securely. This brand has been around for over a decade having been founded in 2004. Their sole mission was to make trampolines safer, more enjoyable, and with better designs. They are the pioneers of a high-quality enclosure net which is now a standard for trampolines by the American Standard for Testing Materials. They have a patented net enclosure system which involves a button-hole located on each V-ring. It interlocks with the base of the enclosure and the trampoline mat. This means you won’t need to use ropes thus eliminating gaps which are potentially dangerous for toes and fingers. This company has been making trampolines much longer than Skywalker Trampolines. Since 1995, this brand has dedicated itself to making top-quality trampolines that define durability. They built the first net enclosure that was safe, effective, and affordable. Their trampolines have protected kids around the globe and continue to be popular decades after they were first introduced in the market. If you are looking to engage your kids play time in an exciting and fun way, the best outdoor trampoline is a good start. They provide a great way to get young muscles moving and developing well. They can also work as training spaces for young athletes. Our top best pick is the Skywalker Trampolines Jump N’ Dunk. It is a multi-purpose model that is durable with maximum safety. It can withstand lots of pressure to provide the ultimate fun for kids. If you also want to partake in jump and play, you can opt for a model with the highest weight capacity like the Exacme Trampoline. No matter what type of trampoline fits your needs and budget we know our reviews will help you find the perfect one.